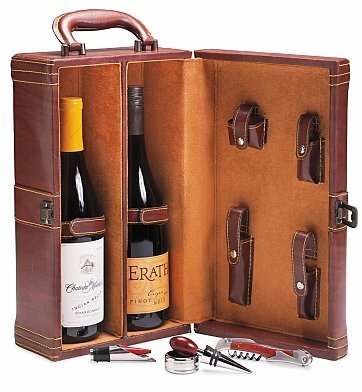 A handsome, top-stitched wine tote securely holds your choice of fine wine as well as a waiter's corkscrew, drip ring, pour spout, and stopper. Perfect for picnics, concerts, or travel, the combination of tote and wine make a wonderful gift for the wine enthusiast. Your choice of wine duo will arrive securely and elegantly presented within the tote. Please view the Tasting Notes Tab to learn more about our prestigious wine offerings. A unique and distinguished gift. Measures 14" x 8" x 5". Personalize it! Complete the engraving option during checkout and we'll add an engraved plaque to the tote. It is a stylish finishing touch that will make the gift a treasured keepsake. Select one or two lines of up to 15 characters per line, or choose an elegant three character monogram. A personalization charge will be automatically added to the total when the engraving option is selected. Fine Wine Tote is a hand delivered gift. These gifts are delivered by one of our local design centers located throughout the United States and Canada. Same day delivery is available for most gifts when ordered before the cutoff time. The cutoff time for Fine Wine Tote is in the recipient's time zone.